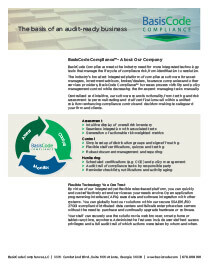 BasisCode Compliance Essentials is a core compliance management software that helps manage the risk lifecycle from identification to resolution. 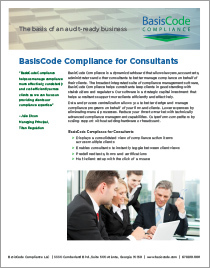 BasisCode Compliance Essentials offers a basic set of compliance management tools that simplifies management of the core elements of a compliance program and is ideally suited for organizations with simpler compliance management needs. 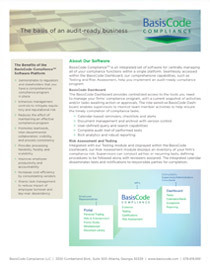 The software includes testing and certifications, risk assessment, gifts and entertainment, whistleblower, document portal, robust reporting and an employee portal for ease of use and seamless interaction with employees.As in all BasisCode products, BasisCode Compliance Essentials features our hallmark, audit-ready capability. The Testing module enables officers to create and conduct ad hoc or recurring tests. Procedures, policies and reviewers are defined and the integrated calendar disseminates tests and notifications to responsible parties for completion. Tailor certifications and staff compliance quizzes with individualized questions, hyperlinks to attachments, dependent questions and control response types. Quizzes tally employee responses and return scores to supervisors, so you can make sure your staff stays compliance savvy. Seamlessly accessed from the BasisCode Dashboard, our compliance Risk Assessment module displays an inventory of your firm’s compliance risk, provides the ability to rank and weight risk factors, archive past assessments and link to the controls (testing, certifications, etc.) that are mitigating identified risks, thus demonstrating an audit-ready business to regulators, senior management, and your Board. Leverage the Employee Portal to engage your staff in maintaining a culture of compliance. Web-based access with reminders and alerts helps ensure the timely exchange and tracking of information among employees and other stakeholders. Employees can enter gift and entertainment disclosures; complete ad-hoc forms and route them for processing; report an incident anonymously to designated officers; and access documents published by the compliance team through the online library.